Toshiba C50D 15.6" Best Student Laptop AMD E1-6010 Dual Core 12GB RAM 500GB HDD. If you're looking for a laptop that's slim and powerful, pick up a Satellite C50D This value-packed model provides reliable everyday computing performance for regular activities such as email, social networking, photo management, web browsing and office admin -- in an attractively designed package. Intel or AMD processors give you all the speed you need and a range of connectivity options help you to do more with your day. Transfer data fast via USB 3.0 or enjoy your favourite multimedia on a HD TV, via the HDMI port. Watch everything come to life in beautiful detail on the 39.6 cm (15.6-inch) HD widescreen display, and hear everything in clear definition with DTS Sound audio enhancement. So, whether you want dependable home computing, reasonably-priced business computing, or convenient portability for your studies, the C50D has it all. The 39.6 cm (15.6-inch) Satellite C50D is super slim, with a sleek design that stands out in all the right ways. An elegant textured finish defines its distinctive look and gives the laptop a modern feel. Yet, with a tile keyboard, large touchpad and keycap design with improved tactile feedback, it doesn't just look good -- it feels good too. Each Satellite C50D has the mark of Toshiba -- a high-quality design that stands out in all the right ways. The matt textured black finish and tiled keyboard look smart, and help to give the laptop a sleek, modern feel. The chassis includes a U-shaped design and a highlighted power button. The Toshiba Satellite C50D comes with a spacious full-size keyboard with numeric keypad. This is ideal for applications such as spreadsheets, and will ensure that typing on the C50D is always a comfortable experience, wherever you are. DTS Sound comes with TruBass technology, helping you to get deep, rich bass sounds from your speakers. With a choice of Intel or AMD processors, the C50D offers multiple performance options, each delivering incredible responsiveness from the moment you boot-up. Add to that the user-friendly Windows 8.1 operating system, plus a spacious HDD of up to 1TB*, and you're all set to multitask on the move -- with the freedom to work, play, browse and store your files locally. 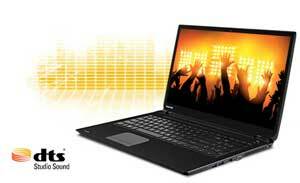 With DTS Sound on your C50D laptop, the audio you hear on your stereo speakers will be enhanced and clear. From the smooth, deep bass to the crisp speech, every voice, movement or tune will be more distinct and enjoyable. So you can immerse yourself in sound every time you stream a film, watch a video, play games or listen to music. 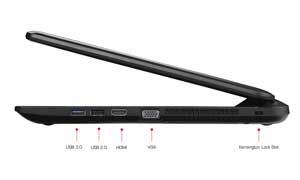 The Satellite C50D has a number of connectivity options available, including HDMI and USB 3.0. DTS Sound includes a sound-enrichment suite that boosts volume, enhances bass and improves definition. Enjoy immersive audio complete with deep, rich bass and crystal clear dialogue. DTS Sound also delivers high-frequency definition for crisp detail in any listening environment, ensuring users a premium and natural entertainment experience whether you are using the laptop speakers or headphones. See your photographs, videos or presentations without wires, fuss or inconvenience. 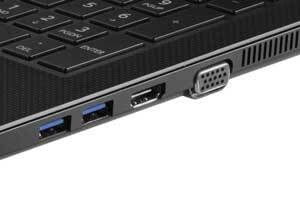 C50D series laptops come with three USB ports, so you can transfer data to your other devices. And because one of those is a USB 3.0 port, it moves your content up to 10 times faster. With Bluetooth 4.0* inside, you can sync your mobile devices wirelessly and transfer large files quickly. Or enjoy rich content on your HD TV, by making the most of your HDMI connection. 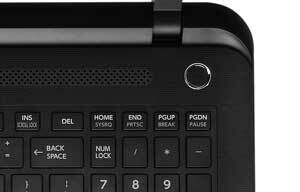 See some of the features of the Toshiba Satellite C50D laptop. 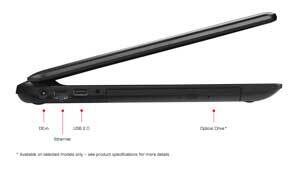 The Toshiba Satellite C50D has an integrated HDMI port for added convenience and enhanced usability. You can connect your laptop to an external device and stream high definition content. When using HDMI, audio and visual content are streamed through a single cable, removing the need for multiple connections. You only need one cable, making connecting your laptop easier and tidier. The Satellite C50D features an integrated HD web camera. The camera and microphone let you see and hear your contacts online, and can take still pictures, video clips and audio notes. With Toshiba's integrated webcam communication is made easy -- network with friends and family from the comfort of your own home.